White Curl Grub, Army Worm, Sod-Web Worm and Fungal diseases can spell disaster for an unhealthy lawn. But with early diagnosis and early treatment you could have your lawn back and fighting fit in no time. If you see brown patches appearing from mid to late summer and you suspect its caused by army worm, flood the area with water and they will come to the surface. Although they may occasionally attack a Zoysia lawn, they generally prefer other types of lawn including Buffalo, Kikuyu, and Couch. There are various forms of controls that you can buy to kill these pests. Apply them just before dusk and repeat weekly until they are dead. The other lawn damaging caterpillar in Australia is the Sod Webworm. They harm cool season turf types far more, but still can cause significant damage to warm season lawns like buffalo, Kikuyu and Couch, but rarely Zoysia. If you see dead patches and silken webs on the lawn in the morning, you may have web worm. After applying the chemical to kill lawn web worm, water it in well. Not all lawn pests are caterpillars. Black beetle can cause damage if they are in large numbers. In smaller populations they rarely cause significant damage. Black Beetles start life as a curl grub or c shaped larvae. At the black beetle stage they may eat your ornamental plants and a little of your lawn, but its at the larvae stage in Spring and Autumn that they live under your turf and eat the roots and rhyzomes of your lawn. If Black beetle is causing significant damage, then an inexpensive powder insecticide can be applied to the soil and watered in whenever the pests are active. Lawn diseases in Australia can make a lawn look unsightly, but if you have a Couch, Kikuyu, Buffalo, or Zoysia type lawn, then the damage will rarely be widespread and irreversible. Cool climate turf types like Fescue, Rye Grass, and Kentucky Bluegrass can be damaged far more by disease, and can sometimes be wiped out, as they generally do not repair themselves well. With warm season lawns, fungus diseases such as grey leaf spot, or Dollar spot can sometimes cause unsightly problems, usually in summer, so if the disease bothers you, use a Fungicide treatment. The best way to keep these insects and diseases away from your lawn is to do proper maintenance, proper watering, proper mowing, proper fertilising and so on, but sometimes even with that, insects and disease can cause significant damage so be vigilant, treat infestations, but don’t panic. A well maintained lawn can better stand up to the abuse of insects and diseases. If insect or disease damage does occur, fertilise and water the lawn well, and you will find it will generally repair itself. Choosing the right turf for your situation depends on a number of factors including, shade, desired maintenance, wear, salt, aesthetics, frost, available water, where you live and cost. Whether its soft leaf Buffalo grass, Kikuyu Turf, Couch lawn, or Zoysia, the right lawn can be matched to your conditions, whether you live in Sydney, Melbourne, Adelaide, Brisbane, or anywhere else in Australia. Here are a few quick guidelines to follow so you get an idea as to what might be the right turf for your situation. If you have an area that has up to 40% shade then a Zoysia turf type will be suitable. If you have an area that has up to 60% – 70% shade then a soft leaf Buffalo type will manage this nicely. If you don’t have time to mow and edge, the slower growing, lower maintenance varieties of Soft Leaf Buffalos would suit. Palmetto Soft Leaf Buffalo is the lowest maintenance popular Buffalo in Australia. If you really want to avoid using any pesticides while maintaining your lawn then all Zoysia types are highly resistant to lawn grub, particularly Army Worm and Web Worm. If you have dogs or hard playing kids, (or both) then as well as wear tolerance, you need to factor in whether it will be in full sun or shade. 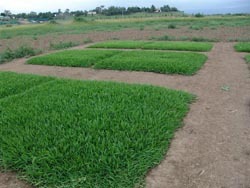 If your area is in full sun, look into Kikuyu turf and particularly Kenda Kikuyu as it has 4 times more underground growth than regular Kikuyu. If your area is in both shade and sun, a buffalo type will be good. Sapphire Buffalo is the number one Buffalo in shade for wear. Not as wear tolerant as Kenda in sun, but it is lower maintenance and works in shade. If you live near the ocean or have a salt water pool, these are the best varieties. In full sun to light shade, Nara Zoysia is far more salt tolerant than Couch, Kikuyu and Buffalo. In shade and sun Sapphire Buffalo and Palmetto Buffalo will work well as long as the salt water is no higher than the average for pool salt water, these Buffalos are more salt tolerant than other Buffalos.